Up to present, the Ministry haven’t had any document reflecting reality and international experience and the one that would propose unified standard for the librarians. Standard for Public School librarian defines professional skills, values and responsibilities that will encourage implementation of National Curriculum. The Standard aims at improving teaching and learning quality in general education institutions. What is the IFLA Trend Report? In the global information environment, time moves quickly and there's an abundance of commentators trying to keep up. With each new technological development, a new report emerges assessing its impact on different sectors of society. 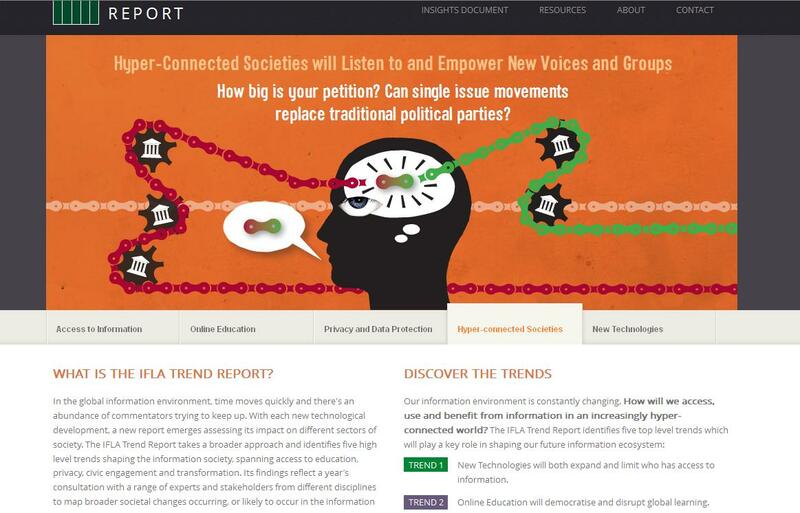 The IFLA Trend Report takes a broader approach and identifies five high level trends shaping the information society, spanning access to education, privacy, civic engagement and transformation. Its findings reflect a year’s consultation with a range of experts and stakeholders from different disciplines to map broader societal changes occurring, or likely to occur in the information environment. There are currently 0 users and 832 guests online.